The Order of Australia is an order of chivalry established on 14 February 1975 by Elizabeth II, Queen of Australia, to recognise Australian citizens and other persons for achievement or meritorious service. Before the establishment of the order, Australian citizens received British honours. The Queen of Australia is Sovereign Head of the Order, while the Governor-General is Principal Companion/Dame/Knight (as relevant at the time) and Chancellor of the Order. The Governor-General's Official Secretary, currently Paul Singer, is Secretary of the Order. Honorary awards at all levels may be made to deserving non-citizens – these awards are made additional to the quotas. The ribbon of the order is blue with a central stripe of golden wattle flower designs; that of the military division has additional golden edge stripes. AKs,[note 1] male ACs and AOs wear their badges on a necklet; male AMs and OAMs wear them on a ribbon on the left chest. Women usually wear their badges on a bow on the left shoulder, although they may wear the same insignia as males if so desired. A gold lapel pin for daily wear is issued with each badge of the order at the time of investiture; AK/AD[note 1] and AC lapel pins feature a citrine central jewel, AO and AM lapel pins have a blue enamelled centre and OAM lapel pins are plain. The order's insignia was designed by Stuart Devlin. While State Governors can present the Officer and Member level and the Medal of the Order of Australia to their respective state's residents, only the Queen of Australia or the Governor-General can present the Companion level (and previously also the Knight/Dame level). General Division: "Extraordinary and pre-eminent achievement and merit of the highest degree in service to Australia or to humanity at large". Military Division: Not awarded in the military division. There was a quota of four per year, excluding honorary appointments. The Knight- and Damehoods were conferred from 1976 to 1983, and from 2014 to 2015, and thus are not currently awarded. General Division – 'Eminent achievement and merit of the highest degree in service to Australia or to humanity at large'. Military Division – 'Eminent service in duties of great responsibility'. Excluding honorary appointments, until 2003, no more than 25 Companions were appointed in any calendar year. In 2003 this was increased to 30. This was increased in 2016 to 35. General Division – 'Distinguished service of a high degree to Australia or to humanity at large'. Military Division – 'Distinguished service in responsible positions'. Prior to 2003, the quota was 100 Officers appointed in any calendar year. In 2003 this was increased to 125. This was increased in 2016 to 140. General Division – 'Service in a particular locality or field of activity or to a particular group'. Military Division – 'Exceptional service or performance of duty'. Prior to 2003, the quota was 225 Members appointed in any calendar year. This was increased to 300 in 2003, to 340 in 2016, and to 365 in 2018. Military Division – 'Meritorious service or performance of duty'. There are no quota limits on awards of the Medal of the Order. Since 1976 any person may nominate any Australian citizen for an award. The nominations are reviewed by the Council for the Order of Australia, and then approved by the Governor-General. The Order is awarded on Australia Day and on the Queen's Birthday public holiday in June, when public announcements are made about new awards, on the occasion of a special announcement by the Governor-General (usually honorary awards), and on the appointment of a new Governor-General. People who are not Australian citizens may be awarded honorary membership of the Order at all levels. Appointments to the Order are not made posthumously; however, if a nominee dies after accepting an appointment but before the relevant announcement date, the appointment stands and it is announced as having effect from no later than the date of the nominee's death. A nomination for an Order of Australia award starts with an Australian citizen filling in a confidential form and submitting it to the Honours Secretariat at Government House in Canberra. This form is not covered by the Freedom of Information Act. The nomination forms are given to the Council for the Order of Australia. Who attends meetings of the council and reasoning as to why a nomination either did or did not result in an appointment is confidential. The council makes recommendations to the governor-general, who presents the order's insignia to new appointees, The council may also advise the governor-general to remove an individual from the order. Announcements of all awards, cancellations and resignations appear in the Commonwealth Gazette. People awarded honours have the option of not having the information appear on the "It's an Honour" website. The Order of Australia was established on 14 February 1975 by letters patent of Her Majesty Queen Elizabeth II of Australia, the Australian monarch, and countersigned by Prime Minister Gough Whitlam. The original order had three levels: Companion (AC), Officer (AO) and Member (AM) as well as two divisions: Civil Division and Military Division. At the time it was also announced that Australian prime ministers would no longer nominate persons for British Imperial honours, but this new practice did not extend to nominations by state premiers. On 24 May 1976, the level of Knight (AK) and Dame (AD) and the Medal of the Order of Australia (OAM), were created by the Queen on the advice of Whitlam's successor, Malcolm Fraser, and the Civil Division was renamed the General Division. The level of Knight/Dame was awarded only in the General Division. The original three-level structure of the Order of Australia was modelled closely upon the Order of Canada, though the Order of Australia has been awarded rather more liberally, especially in regard to honorary awards to foreigners. To date, only 24 non-Canadians have been appointed to the Order of Canada, while more than 390 non-Australians have been appointed to the Order of Australia, with 40 to the "Companion" level. 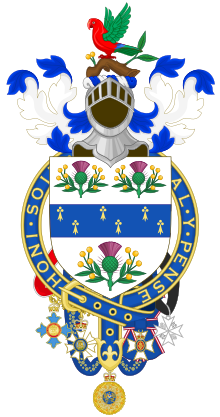 The neck badge of a Knight of the Order of Australia appeared at the base of the coat of arms of Sir Ninian Stephen. Following the 1983 federal election, Prime Minister Bob Hawke advised the abolition of the knight/dame level. On 3 March 1986, the Queen co-signed letters patent revoking the level, with existing knights and dames not being affected by the change. In the period 1976–1983, twelve knights and two dames were created, all but one of whom—Prince Charles—are now deceased. On 19 March 2014, Prime Minister Tony Abbott advised the Queen to reinstate the level of knight/dame and the Queen co-signed letters patent to bring this into effect. The change was publicly announced on 25 March, and gazetted on 17 April 2014. Up to four knights and/or dames could be appointed each year, by the Queen of Australia on the advice of the Prime Minister of Australia after consultation with the Chairman of the Order of Australia Council. Five awards of knight and dame were then made, to the outgoing Governor-General, Quentin Bryce; her successor, Peter Cosgrove; a recent Chief of the Defence Force, Angus Houston; a recent Governor of New South Wales, Marie Bashir; and Prince Philip. The Australian Labor Party continued to oppose knighthoods and damehoods. Leader of the opposition Bill Shorten stated in March 2014 that the party would again discontinue the level if it were to win the next Australian federal election. Abbott's tenure as prime minister ended in September 2015. Two months after coming into office, on 2 November 2015, pro-republican Prime Minister Malcolm Turnbull announced that the Queen had approved his request to amend the Order's letters patent and cease awards at this level. Existing titles would not be affected. The move was attacked by monarchists and praised by republicans. The amendments to the constitution of the Order were gazetted on 22 December 2015. Charles, Prince of Wales was appointed a Knight of the Order of Australia (AK) on 14 March 1981. As he is not an Australian citizen, even though he is the heir to the Australian throne, this would have required the award to be honorary. To overcome this issue, his appointment was created by amendment to the constitution of the Order of Australia by special letters patent signed by the Queen, on the recommendation of Prime Minister Malcolm Fraser. In March 2014 the knight and dame levels, which had been abolished in 1986 by Prime Minister Bob Hawke, were reintroduced to the Order of Australia by Tony Abbott. At the same time, Abbott announced that future appointments at this level would be recommended by the prime minister alone, rather than by the Council of the Order of Australia, as is the case with all lower levels of the order. In accordance with the statutes of 2014, Prince Philip, Duke of Edinburgh was created a Knight of the Order by letters patent signed by the Queen on 7 January 2015, on Abbott's advice. Prince Philip's knighthood was announced as part of the Australia Day Honours on 26 January 2015 and his appointment attracted criticism of what Abbott described as his "captain's call". Abbott responded by announcing that future recommendations for appointments as Knights and Dames of the Order would be determined by the Council of the Order of Australia. Harriet Mayor Fulbright, Lord Harewood, Brian Lara, Sachin Tendulkar and Robyn Williams. In December 2010, The Age reported a study of the educational backgrounds of all people who had received Knight/Dame and Companion level awards at that time. It reported: "An analysis of the 435 people who have received the nation's top Order of Australia honours since they were first awarded in 1975, shows they disproportionately attended a handful of elite Victorian secondary schools. Scotch College alumni received the highest number of awards, with 19 former students receiving Australia's [then] highest honour". On 26 January 1980 the order's award recipients formed the Order of Australia Association. This organisation seeks to aid the members of the order in their pursuits related to the development and maintenance of Australia's culture and traditions. The organisation also attempts to increase awareness of those honoured by the order, since many of their number are not household names, despite their contributions. Branches of the association can be found in all the states and territories of Australia. "Imperial" honours awarded after 5 October 1992 have been classed as "Foreign awards", and hence have lower precedence than all Australian awards. The award is parodied in the play Amigos, where the central character is determined to be awarded the AC, and uses persuasion, bribery and blackmail in his (ultimately successful) attempts to get himself nominated for the award. During the 1996 season of the popular television programme Home and Away, the character Pippa Ross was awarded a Medal of the Order of Australia for her years of service as a foster carer. ^ a b c d e f g The level of Dame/Knight was established in 1976, disestablished in 1986, re-established in 2014 and again disestablished in 2015; neither disestablishment affected existing awards. ^ The totals quoted are actually the number appearing in the It's an Honour database. These numbers do not include: recipients who do not wish to appear in the database; recipients who have resigned from the order; and recipients who have had their award cancelled. ^ The Medal of the Order of Australia was established 1976. ^ Resignation and cancellation have occurred up to the Companion level – see List of Companions of the Order of Australia#Former Companions. ^ "It's an Honour Advanced Search". Retrieved 28 January 2019. ^ "Order of Australia". dpmc.gov.au. ^ a b "Knights, dames return under Abbott". The Sydney Morning Herald. 25 March 2014. Archived from the original on 25 March 2014. Retrieved 25 March 2014. ^ a b Bourke, Latika (2 November 2015). "Malcolm Turnbull scraps Tony Abbott's Knights and Dames". The Sydney Morning Herald. Archived from the original on 7 January 2016. Retrieved 2 November 2015. ^ a b c d e f g h "The Order of Australia". gg.gov.au. Retrieved 28 January 2019. ^ Honours of the Crown Archived 25 June 2008 at the Wayback Machine, www.monarchist.ca, p. 11. ^ Constitution of the Order of Australia (Number of Appointments in the General Division) Ordinance 2018, Commonwealth of Australia Gazette, 19 April 2018. ^ "FAQs". The Order of Australia Association. Retrieved 23 June 2014. ^ "Nominating for Awards". Itsanhonour.gov.au. Australian Government. Retrieved 23 June 2014. "Andrew Laughton's Freedom of Information requests". Right To Know. February–April 2013. Retrieved 23 June 2014. ^ "Termination of Appointment of Member of the Order of Australia in the General Division made to Dr Leslie Howard". legislation.gov.au. Retrieved 16 September 2013. "Termination of Appointment of Member of the Order of Australia in the General Division made to Mr Clinton Edward Condon". legislation.gov.au. Retrieved 16 September 2013. ^ "Terminations and Cancellations Ordinance – Order of Australia – Amendment – 11/09/2007". legislation.gov.au. Retrieved 16 September 2013. ^ "About the Database". Itsanhonour.gov.au. Australian Government. 3 April 2007. Retrieved 16 September 2013. ^ Barwick, Garfield (1995). A Radical Tory: Garfield Barwick's Reflections and Recollections. Federation Press. p. 266. ISBN 978-1-86287-236-3. ^ Duke, Suzanne (1984). Debrett's Handbook of Australia and New Zealand. Debrett's Peerage. p. 47. ISBN 0-313-26126-1. ^ "Letters Patent amending the Constitution of the Order of Australia". Government Notices Gazette C2014G00635. Commonwealth of Australia. ^ "A new honour for pre-eminent Australians". Media release. Office of the Prime Minister of Australia. 25 March 2014. Archived from the original on 25 March 2014. Retrieved 25 March 2014. ^ Knott, Matthew (28 March 2014). "Bill Shorten would reverse reinstatement of knights and dames if elected prime minister". The Sydney Morning Herald. Archived from the original on 5 June 2014. Retrieved 3 August 2014. ^ Norman, Jane; Iggulden, Tom (2 November 2015). "Knights and dames scrapped from Order of Australia, Malcolm Turnbull says". Australia: ABC News. Archived from the original on 18 April 2016. Retrieved 2 November 2015. ^ Medhora, Shalailah (2 November 2015). "Knights and dames removed from Order of Australia by Malcolm Turnbull". The Guardian. Australia. Archived from the original on 5 March 2016. Retrieved 2 November 2015. ^ "Malcolm Turnbull's 1999 referendum loss behind dumping knights and dames: David Flint". The Sydney Morning Herald. 2 November 2015. Retrieved 2 November 2015. ^ FitzSimons, Peter (2 November 2015). "By scrapping knights and dames, the Age of Turnbull has returned us to 2015". The Sydney Morning Herald. Archived from the original on 5 November 2015. Retrieved 2 November 2015. ^ Kenny, Mark (2 November 2015). "Malcolm Turnbull clears the royal barnacle and starts a debate Tony Abbott never could have". The Sydney Morning Herald. Archived from the original on 5 November 2015. Retrieved 2 November 2015. ^ Amendments to the Constitution of the Order of Australia, Gazette C2015G02163, 22 December 2015. ^ "Order of Australia – Constitution – Letters Patent – Amendment – 14/03/1981". legislation.gov.au. Retrieved 17 May 2012. ^ "Amendments to the Constitution of the Order of Australia". Government Notices Gazette C2015G00155. ^ "Search Australian Honours – Advanced Search". Its an Honour. Awards and Culture Branch, Australian Department of Prime Minister and Cabinet. 26 January 2019. Retrieved 26 January 2019. Separate searches conducted for Knights, Companions, Officers, Members and Medals of the Order. ^ Topsfield, Jewel (4 December 2010). "Ties that bind prove a private education has its awards". The Age. p. 11. Look up Order of Australia in Wiktionary, the free dictionary. 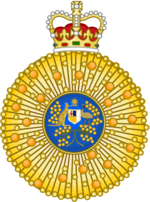 Wikimedia Commons has media related to Order of Australia. Office of the Official Secretary to the Governor-General (2014). Order of Australia (PDF). Canberra: Government House. Order of Australia including list of the Order, its history and its "Constitution" (statutes). This page was last edited on 10 April 2019, at 10:37 (UTC).